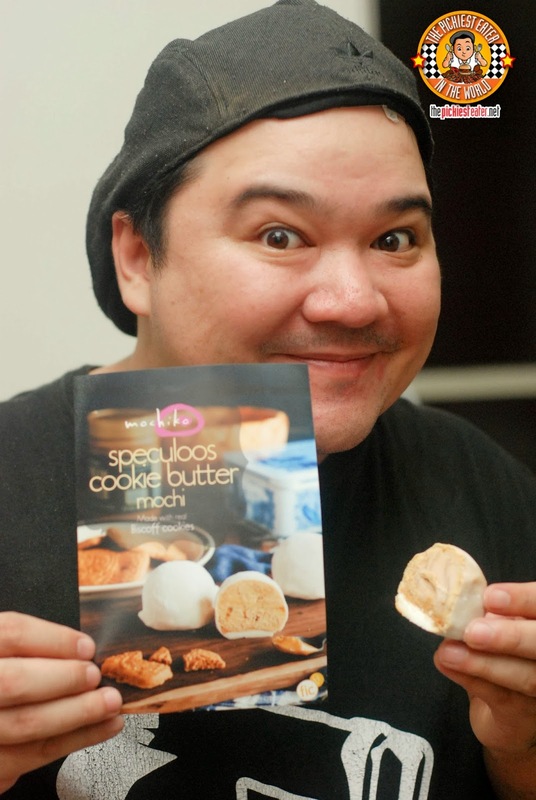 THE PICKIEST EATER IN THE WORLD: QUICK PICK: SPECULOOS COOKIE BUTTER MOCHI FROM MOCHIKO! 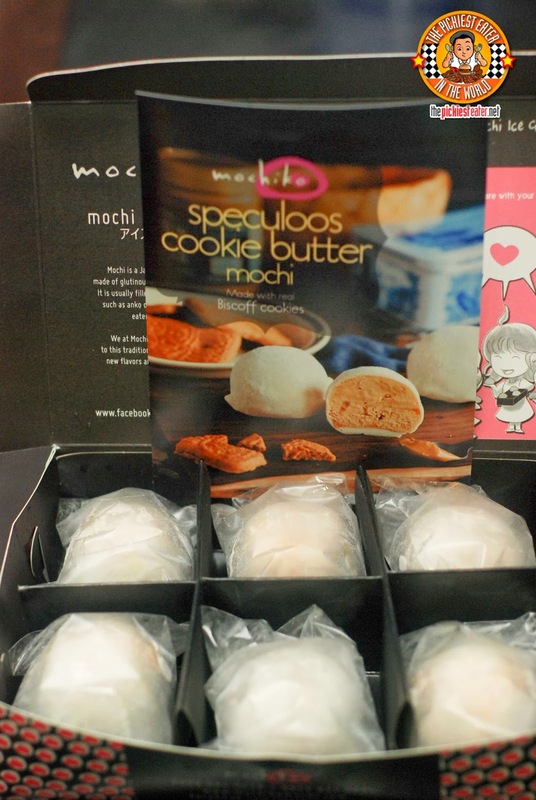 QUICK PICK: SPECULOOS COOKIE BUTTER MOCHI FROM MOCHIKO! From the very first millisecond that I heard the words "Cookie Butter" from my friend, Spanky, I immediately became enamored with it. Admit it.. the words "Cookie Butter" even sounds delicious. People ask what Rina and I like eating our Cookie Butter best with. Well, Rina loves it with hot Pan De Sal. I knew Cookie Butter would open a floodgate of new dessert possibilities.. From Cupcakes, to donuts and even simple delicacies such as Polvoron, the possibilities seemed endless. Mochiko is one of the brands that is constantly in touch with their customers wants and needs, always innovating and creating new flavors. So it was inevitable that Mochiko's latest release, is a spin on the latest global food craze.. Behold.. The Speculoos Cookie Butter Mochi! Rina and I have had a thing for Mochiko's frozen Mochi's since the very first time I sunk my teeth (And... umm.. got it stuck) into these frozen bad boys (I was told by the sales lady I needed to wait three minutes before I bit into it because it was too hard. I responded with "Challenge Accepted". Challenge Failed) at Mercato Centrale. Given the fact that I already went nuts over their Cookies and Cream (With Oreo! ), I was extremely eager to give their Speculoos Cookie Butter Mochi a try! 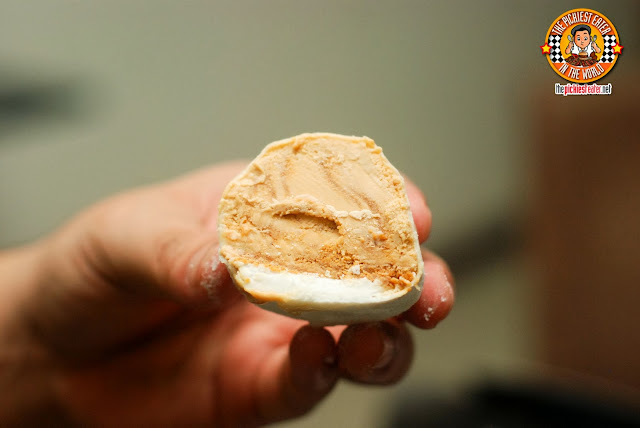 The Mochi is filled with Cookie Butter Ice Cream, including a delicious cookie butter ripple! The ice cream is placed on top of a Biscoff cookie, adding a bit of a crunch to your bite, before being encased in a delicate rice cake wrap, ingeniously creating your Mochi Ball (The Japanese think of EVERYTHING)! In case you were wondering, it does taste as awesome as it sounds! The brilliant minds at Mochiko have knocked yet another one out of the park, with the Speculoos Cookie Butter Mochi! BPI LIVING WITH AN EDGE! NOMAMA RAMEN BOWL FEST: FREE RAMEN FOR 60 DAYS! I SALUTE THE SINGAPORE FOOD REPUBLIC IN BGC! URBN BAR & KITCHEN'S NEW BAR CHOW!